Spring Carpet Cleaning Tip: Long Distance Carpet Cleaning The Easy Way! When you are hiring service providers at a distance, whether for a rental property or your own home or business, you want a dependable carpet cleaning provider, experienced with long-distance service. Rest assured that the team at PRO is reliable, and will follow through. We'll provide you with an estimate in advance and discuss your carpet cleaning project beforehand. Our customers sometimes call from out of state, or ask about the process for hiring at a distance, and our spring carpet cleaning tip offers an easy checklist and sets expectations for a great carpet cleaning experience! 1. Give us a call for an estimate: We'll provide an estimate in advance by phone or email, prior to work being scheduled, we'll just have a few questions about the location to be cleaned (on-site estimates also available). 2. Day of service verification: On your selected appointment day, we will verify square footage and price, relaying that information with a call to confirm before any work is performed. 3. Property access: If an entry code is not available, we can meet with your local designee (family member, property manager) at a time that is convenient for them. 4. Cleaning process: Expect great service! 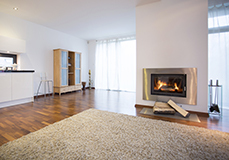 Property carpeting can be cleaned with or without furniture, our team will move items if necessary. If there is room for improvement we can come back. We guarantee our work! 5. Check for any heavy traffic areas or spots: We'll communciate any issues with carpet, traffic areas, stains, etc., and apply appropriate stain removal processes if necessary. 6. Optimal drying environment: We will recommend turning on heat or air conditioning at normal operating temperatures for carpeting to dry following cleaning; we may consider environmental factors such as high heat or humidity and communicate any needed adjustments to indoor climate. 7. Final check-in: We'll secure the property, and call for payment when the job is complete. We can provide a receipt by email and a hard copy by regular mail, according to your preference. 8. Followup: If there is ever a concern about the project, we're happy to follow up with you, or come back. Just call! Beyond offering green carpet cleaning, we’d like to offer a little something extra in April 2016: a Spring Carpet Cleaning Coupon! 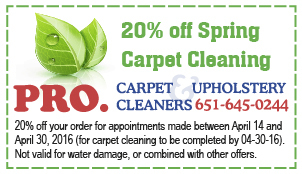 Schedule your spring carpet cleaning between April 14 and April 30, 2016 and receive 20% off your carpet cleaning order when your appointment is scheduled to be completed by April 30, 2016.